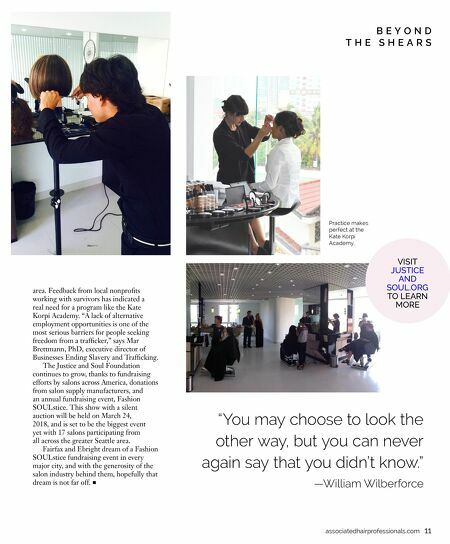 10 Beauty Sense Cuts, color, image overhauls, therapy sessions, confidence boosts, first-class pampering, fighting human trafficking—is there anything hair professionals can't do? Wait—hair professionals are helping to fight human trafficking? The idea seems almost as ludicrous as the fact that human trafficking and slavery even exist in our modern world, but that's exactly what the Justice and Soul Foundation was created to fight. Changing a Life In 2009, Matthew Fairfax and Lauren "Kate" Ebright—two hairstylists from Seattle who bonded over a mutual calling to help the 20.9 million adults and children bought and sold worldwide into commercial sexual servitude, forced labor, and bonded labor—took a trip to Cambodia to see the problem firsthand. For these big-hearted hairstylists, there was simply no ignoring what they witnessed. 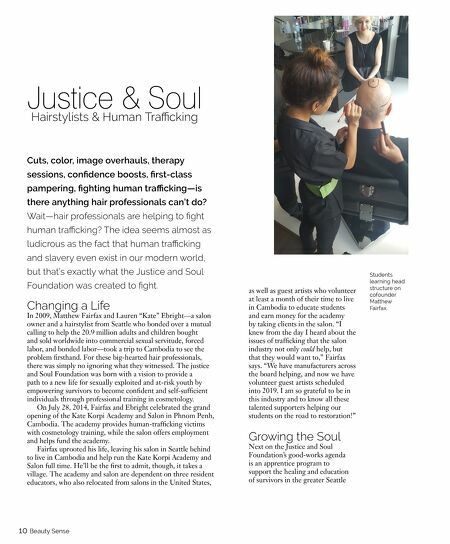 The justice and Soul Foundation was born with a vision to provide a path to a new life for sexually exploited and at-risk youth by empowering victims to become confident and self-sufficient individuals through professional training in cosmetology. On July 28, 2014, Fairfax and Ebright celebrated the grand opening of the Kate Korpi Academy and Salon in Phnom Penh, Cambodia. The academy provides human-trafficking victims with cosmetology training, while the salon offers employment and helps fund the academy. Fairfax uprooted his life, leaving his salon in Seattle behind to live in Cambodia and help run the Kate Korpi Academy and Salon full time. He'll be the first to admit, though, it takes a village. The academy and salon are dependent on three resident educators, who also relocated from salons in the United States, Justice & Soul Hairstylists & Human Trafficking as well as guest artists who volunteer at least a month of their time to live in Cambodia to educate students and earn money for the academy by taking clients in the salon. "I knew from the day I heard about the issues of trafficking that the salon industry not only could help, but that they would want to," Fairfax says. "We have manufacturers across the board helping, and now we have volunteer guest artists scheduled into 2019. I am so grateful to be in this industry and to know all these talented supporters helping our students on the road to restoration!" Growing the Soul Next on the Justice and Soul Foundation's good-works agenda is an apprentice program to support the healing and education of survivors in the greater Seattle Students learning head structure on founder Matthew Fairfax. So You Want Unicorn Hair?